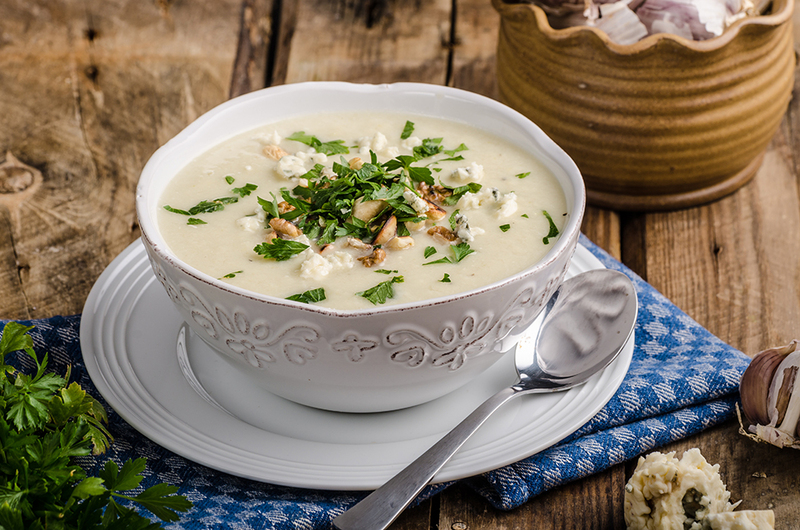 Cauliflower & Blue Cheese Soup | The Essential Broth Co.
Heat cauliflower florets and diced onion gently in a saucepan with butter and olive oil, then cover when they start to sizzle. Sweat for around 10 minutes or until soft, but don’t let them brown. Add chicken broth, onion powder and paprika then simmer for a further 10-15 mins season to taste with salt and pepper. Add back to a low heat with cream and 100grms of blue cheese for 5 minutes, stirring gently. Serve and garnish with fresh chives and crumble over the remainder of blue cheese. Handy Tip…Chicken Croutons: Dice up some sourdough and toss in some chicken broth. Drizzle with olive oil and dry in oven on a low heat. Then toss with flaky sea salt and freshly chopped flat leaf parsley.